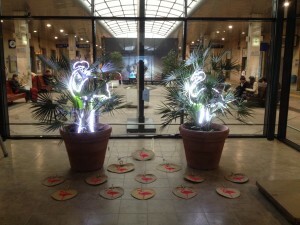 In 2015, at the invitation of Maria Paola Zedda and as part of the Cagliari 2015 – Capital Italiana Della Cultura festival I presented a concert of electronic music, ‘Flirting With Flamingos’, and an installation ‘Flamingo Shrines – Walking In Molentargius’, in the city of Cagliari in Sardinia. Both projects were collaborations with students from the Conservatorio di Musica Pierluigi de Palestrina and artist Tiziana Argiolas. 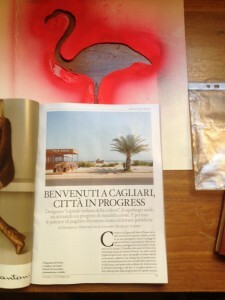 Thanks also to Daniele Ledda and Giulia Palomba. 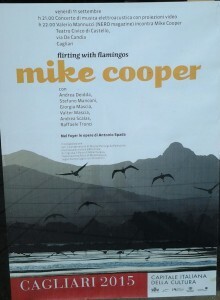 The complete project was spread over four months and involved making field recordings, video and photographs in the salt lakes situated in the Parco di Molentargius near Cagliari which is home to, among other species of birds,animals and fish, around 50,000 flamingos. 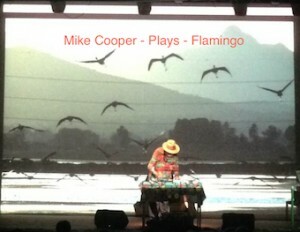 Andrea Deidda, Stefano Manconi, Giorgia Mascia, Valter Mascia, Andrea Scalas and Raffaele Tronci sound, video and photography and Tiziana Argiolas who made the led light Flamingos. 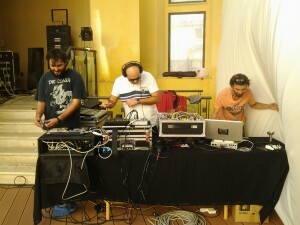 Sound check for (l-r) Raffaele Tronci, Andrea Scalas,Andrea Deidda. 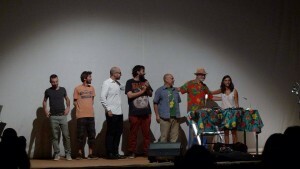 The ‘team’ – Andrea Deidda, Stefano Manconi, Giorgia Mascia, Valter Mascia, Andrea Scalas and Raffaele Tronci. 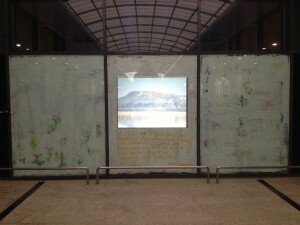 The installation was inside a glass box obviously intended to be a station shop but which had never been completed or used. I decided to cut the site into two halves as there was a door halfway down both sides and close one side. In one half I placed two palm trees with Tiziana’s LED light flamingos and 13 palm leaf fans with a stencilled flamingo on each piece. 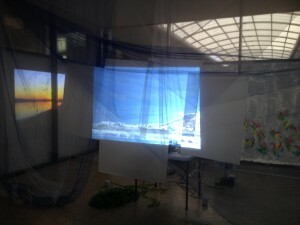 Side A was divided from side B by a mosquito net, muslin and tracing paper screen onto which one of four videos was projected. 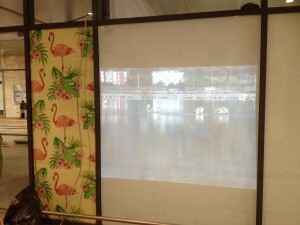 The other three videos were projected onto three whitewashed walls and could be viewed from outside.